As per usual, Apple has released Monday's keynote in full on its events webpage, offering those who missed the product-packed event a second chance to watch Apple execs introduce iOS 7, Mac OS X Mavericks, the radically redesigned Mac Pro, faster MacBook Air, and more. 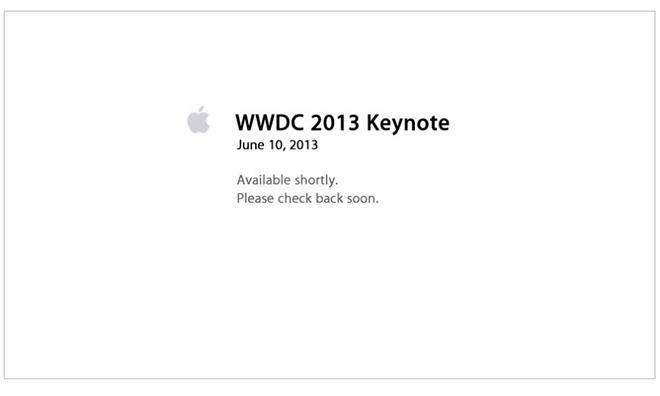 While Apple streamed the WWDC 2013 keynote on its website and via a special Apple TV app this morning, the full keynote has now been uploaded to the company's events page. The entire 120-minute video can be streamed through most Web browsers, with highlights including iOS 7, OS X Mavericks, the upcoming Mac Pro, MacBook Air, iTunes Radio, iWork for iCloud beta, and the AirPort Extreme and Time Capsule. As of this writing, a holding page is being displayed, though the video is expected to be ready shortly.